Villa Grand View is a 5 bedroom superior mountain top villa amongst the picturesque hills of Bophut that offers a stylish standard of living with stunning panoramic sea views. Hilltop View 2 is designed with an extremely large open plan dining and living area downstairs that includes a separate TV room at close proximity. Teak flooring is carried throughout the corridors, all of the bedrooms and the magnificent connecting staircase, whilst an unusual collection of Asian antiques, collected by the owner over a number of years, is on display for all guests to enjoy. Laguna Waters 132 offers guests a peaceful and luxurious island retreat in the heart of Phuket\'s most upscale beachside enclave. The expansive 4-bedroom property features a two-storey main house with generous, open plan living spaces, plus a dedicated guest bedroom pavilion, all set around a 12-metre long pool and comfortably furnished sun terrace. 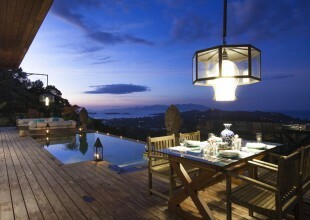 Baan Bua Sawan is a tropical luxury villa located on the northern coast of the picturesque Thai island Koh Samui. Minimalist, yet classic and plush, this serene hideaway spot is sure help relax your body and refresh your spirits. On arrival at Baan Bua Sawan you are greeted by large carved wooden doors which only hint towards the Thai style and stateliness beyond. Villa Belles stunning hillside location, surrounded by lush sloping tropical gardens with impressive feature slate walls and ornamental ponds fringed with traditional Asian carvings, leads guests to the uniquely designed wrought iron main entrance. Baan Maliwan is a contemporary designed 3 bedroom sea view villa overlooking the northeastern coast. Set within the secure gated Dhevatara Residence compound, Baan Maliwan is located on the western end of Bophut beach, within easy reach of restaurants, bars, and spas. Complimentary WiFi internet service is provided throughout the property, which also has a back-up generator. As part of Samui’s most exclusive, prestigious and private estate of just six properties this villa has an instant appeal. From the moment you arrive at the Headland estate you will be struck by the peace and nature of the location. A tree-lined stone pathway leads to each villa and directly onto an idyllic white-sandy beach. *Total \'WOW\' factor panoramic views with total privacy*Baan Kuno occupies a stunning location on the North shore of Koh Samui in Bophut Hills and enjoys incredible ocean views of both Chaweng and Bophut. Built over 3 floors, this property enjoys an amazing sunset ocean view from each floor.On the entrance floor is the large open plan living, dining and kitchen area, which all opens directly onto the outside terrace and infinity edge swimming pool.On the upper floor is 3 bedrooms each overlooking the pool and looking straight out to Bangrak Bay. Located on a lush hillside with spectacular views over the north coast of beautiful Koh Samui in the Gulf of Thailand,this spacious and luxurious four bedroom, open plan villa is fronted by a 14m x 6m infinity-edge swimming poolthat overhangs beautifully landscaped gardens and the tropical jungle below. Located right on the beach, overlooking the Five Island and idyllically set amongst towering palms and exotic flowering plants, this is as near to Man Friday Treasure Island as one can imagine.This authentic Thai-style house was lovingly created by a Swiss businessman, who spared nothing on creating a home of his dreams.